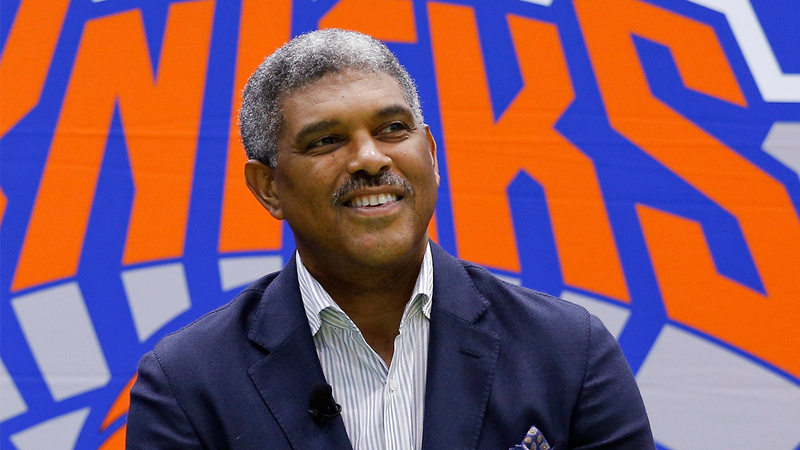 Are the Knicks finally in good hands? NEW YORK (WABC) -- Alright Knicks fans, Phil Jackson can't hurt you anymore. Let him collect millions from James Dolan and hang out in Montana. The Zen Master cannot hurt the Knicks anymore, but what a mess he left before leaving. 1) He managed to get into a petty war of words with the team's best player, Kristaps Porzingis, over his missing his exit interview. While Porzingis is not innocent in this matter, there is no way it should have escalated with Jackson threatening to trade the big man on draft day? Now the Knicks are trying to make nice with the Latvian. 2) Jackson managed to make Carmelo Anthony's value less than it should be. His public campaign to get Melo out of town has other teams offering nothing in return for Melo. Right now, the Knicks can only play defense in any trade talks. 3) Jackson's final present to Knicks fans is top draft pick Frank Ntilikina. The French point guard was brought in because he fit the triangle offense. Guess what? The Knicks are bagging the triangle. Thanks Phil. But Phil cannot hurt the Knicks anymore. Instead, Steve Mills gets a shot as the top man in the operation. His first two moves have already raised eyebrows. 74 million dollars for Tim Hardaway Jr.? That appears to be a major reach, but at least the Knicks get younger and more athletic here. Crowd favorite Ron Baker gets a 2-year deal for nearly 9 million? Baker plays hard, but to get the entire salary exception seems like a reach. But in his third move, Mills may have hit the jackpot. After missing out on a couple of other candidates, Mills brings in Scott Perry as the team's new General Manager. Perry comes with good NBA credentials and on paper seems to be a good choice. The Knicks should allow Perry to do his job and rebuild the teams. Keep Jim Dolan away, keep Steve Mills at a distance and let Perry make the basketball decisions. But remember these are the Knicks!